If I told you there was a sales tool that provided everything you’d ever need for a company’s sales purposes, I’m sure you’d be curious as to hear more. Many companies use archaic and antiquated ways of sales: a spreadsheet, office phone and notepad. What if I told you that you can expedite and refine your sales process all at the same time? I’m talking about using HubSpot’s Sales Professional, a robust and intuitive system that will make your life easier (and your boss happier). I will be diving into the services the Sales Professional level of HubSpot, but first I want to state while this is a paid version, they do offer a completely free CRM (Customer Relationship Management) for those starting out. Which provides many of the base level necessities and still make your sales team more efficient. First things first, if you aren’t using a CRM for your small or medium business, go sign up for the free version of HubSpot and start importing all your contacts. I promise it will make your life exponentially easier. Great, now that you’ve done that, let’s dive into the capabilities of this behemoth of a tool. On a base level, you’ll be able to make calls, store information and build out notes on your prospects, leads and clients. With HubSpot, you’re able to incorporate your email service as well as your phone so everything you do within the tool can be recorded and tracked for use later. One of the most unique things you can do with the email integration is track emails even after they’ve been sent. Meaning if I send you an email I’d be able to know when you open that email and even when you click a link in that email. It may seem a bit invasive, but it’s very useful when you are determining if pursuing that lead is worth it or not. There are a ton of bells and whistles that HubSpot Sales Professional has, but the one I find to be most useful to me is email sequencing. With sequences, you are able to create an email/call cadence that will have your salesperson jumping for joy with efficiency. Sequencing is where you enroll a prospect into an email and call chain that your sales team can use for following up with people. Your salesperson will be sent daily reminders to call that prospect as a followup to the email or introductory call. Every business should have a sales pipeline where they put leads to show how close they are to closing. In HubSpot, you are given a deals pipeline which will show where your leads are at in the sales process. This is a great way to keep all your deals in one place. Have a presentation scheduled with a prospect? You can see where they are in the pipeline. If successful, you can move them through the pipeline and include the amount of money in the deal until it’s time to close, netting yourself a new client. There is so much more that HubSpot’s sales professional has to offer, from sales playbooks, to automatically gathering business information. I highly recommend signing up for the free CRM to start so you can test the waters. It goes without saying that not everything can be perfect. I will say, in the grand scheme of things, HubSpot Sales Professional is damn useful, but it is not without flaws. While there are still a ton of things that HubSpot can do, there are some that I wish it did better. From a mobile standpoint, HubSpot sales is not very useful. On a base level, the mobile app is convenient for what it is. It works as CRM, allowing you to review contacts, make calls and send emails. However, in my experience, it tends to crash and not record the calls I was making. Although HubSpot Sales works great on a computer, I would not recommend making the mobile app your main way of contacting people if documentation is crucial for you. The other thing that stands out to me is how daunting this system can seem at first. Once you dive into HubSpot Sales Professional it’s awesome to have all the tools working in you, but at first, it’s a big system and it’s easy to get lost in all the minute details. HubSpot somewhat acknowledges this and provides a really helpful learning center to show you all their tools, including the Sales Professional. While it may seem like you’ll never master this system, I promise after viewing HubSpot’s training video you will feel much better about what you’re getting yourself into. Not to mention, it’s a free resource. There is something great about HubSpot Sales Professional in the sense that it’s very difficult to find something ugly about it. It is an extremely fine-tuned tool that will improve your sales team’s overall effectiveness. 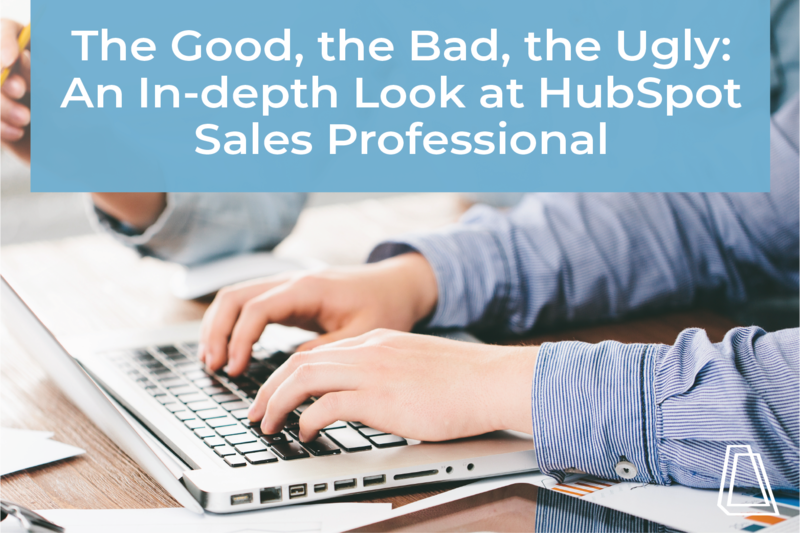 So instead of positioning this as “The Ugly” I should state that using HubSpot Sales Professional will make every other sales and CRM tool look ugly. I feel that I’ve barely scratched the surface of what this can all do. I highly recommend getting this for any company that is looking to centralize your information for your sales process. You will not be disappointed.